Many people consider the Queensborough Bridge at 59th Street to be the city's most romantic because of its intricate tracery of steel girders, its Gothic ornament and the fact that it the most prominent object that can be seen from Sutton Place apartments facing the East River. 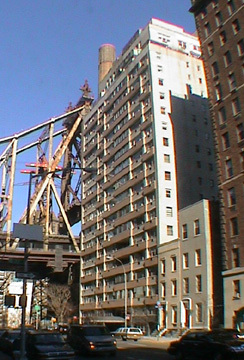 This 21-story building, which was built as a cooperative in 1962, commands front-row seats as it is just across the street from the famous bridge. These views are enhanced by the slow passes of the brightly colored Roosevelt Island tram on the other side of the bridge. There is also a very tall chimney close to its north facade. The building's setting at the northern end of Sutton Place combines the elegance of that short street with the drama of the soaring bridge and the activity beneath it as a large ballfield is across from the building and is converted to a tented tennis facility during the winter and, after many years of controversy, a major food emporium, and a spectacular restaurant, Gustavino's, opened in 1999 under the bridge's Piranesian arches half a block to the west. The building, which has very broad picture windows and an interesting horizontal facade motif, has 138 apartments. Pinkish bands accent and modulate its facade on which some balconies have been enclosed. 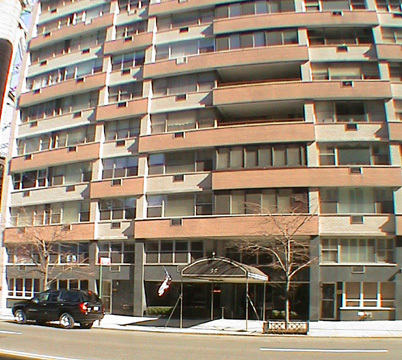 The pinkish sections of the facade are similar to the orange-pink facade of Cannon Point South at 25 Sutton Place South (see The City Review article). The building has a canopied entrance with a step-down entrance and a two-story dark granite base with sidewalk landscaping. Although Sutton Place, one of the city's most desirable residential neighborhoods because of its proximity to midtown, is far from subways, cross-town buses run on 57th Street and the area has several small parks, some of which overlook the river.